The first step is getting all the nutrients you need for proper bone growth. A healthy diet can significantly reduce the risk of bone loss and osteoporosis. And it's never too late to start. Calcium is a crucial building block of bone tissue. Vitamin D helps the body absorb and process calcium. Together, these two nutrients are the cornerstone of healthy bones. Latest research recommends 1,000 mg of calcium a day for most adults and 1,200 mg/day for women after menopause and men after 70. Milk and other dairy products are excellent natural sources of calcium. You'll hit the mark by eating three servings of dairy products a day. Other good food sources of calcium include dairy products, sesame seeds, leafy green vegetables, and broccoli. If you don't eat those foods regularly, talk to your doctor about calcium supplements. Researchers believe that most of us fall short on vitamin D, a critical nutrient. Your body makes it naturally when your skin is exposed to sun. Older people especially are at high risk of vitamin deficiency. The reason: the body becomes less efficient at producing vitamin D as we age. Vitamin D deficiency is common in all ages and few foods contain vitamin D. Vitamin D deficiency is defined as a 25(OH)D below 20 ng/ml and vitamin D insufficiency as a 25(OH) D of 21–29 ng/ml. Adults need at least 600 IU of vitamin D per day for bone health, but some people may need up to 2000 IU to increase blood level of 25 (OH) vitamin D consistently above 30ng/ml. Adults 70 years and older need 800 IU of vitamin D a day to prevent falls and fractures. 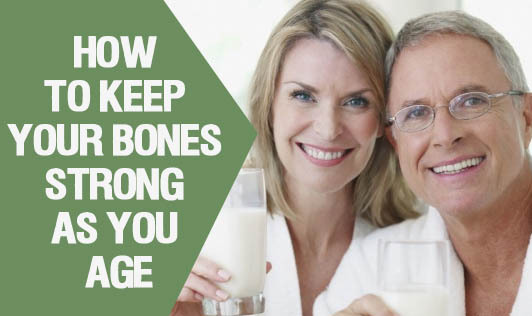 Healthy bones depend on more than calcium and D. We now know that many nutrients are essential to maintaining bone and key nutrients include protein, vitamin B12, magnesium, vitamin C, and other nutrients. The best way to get all the nutrients you need is to fill your plate with whole foods. Nuts, beans, whole grains, and fruit and vegetables are naturally rich in an array of nutrients essential to healthy bones. Research suggests that fruits and vegetables are just as important as dairy products for bone health. Choosing nutrient-rich foods is particularly important as you get older since most people's calorie requirements go down. The challenge is to get as much nutrition into a limited number of calories. Avoid highly processed foods. Processing strips some foods of their natural nutrients. Even when vitamins or minerals are added back, processed foods usually lack the full array of nutrients found in natural foods. Choose whole foods. Whenever you have the choice, go for foods with whole grains, which are far richer in nutrients linked to bone health. Look at the ingredient panel of breads, cereals, and other products made with grain. The first ingredient should be a whole grain. Go for variety. Choose vegetables from across the spectrum of colors, from leafy greens to red sweet peppers. A colorful diet, nutritionists say, will help ensure a balance of nutrients necessary for good bone health. Even the healthiest diet may not provide all the nutrients you need for bone health. If you don't drink milk, for instance, you may be falling short on calcium. Multivitamins or single supplements of specific nutrients can help fill in the gaps. But before you start taking any supplement, it's wise to talk to your doctor. Along with a healthy diet, physical activity is crucial for strong bones. Most people think of exercise as a way to strengthen muscles. But weight-bearing exercises also put stress on the bones attached to those muscles, stimulating them to rebuild themselves. Develop a whole body routine. Strength-building exercises benefit the specific muscles and bones being exercised. So it’s important to develop a routine that involves all the major muscle groups. Each muscle group should be exercised at least once a week. A lot of people are anxious about weight-bearing exercises at first. But once you get into it, you’ll find that you love feeling more stamina and greater strength. Along the way, you'll also be building stronger bones.